On or about 7 October 2014, I heard (or thought I heard — the TV was on but I wasn't really paying attention) a Channel News Asia TV trailer drawing viewers' attention to an upcoming episode of its weekly talk show Talking Point. 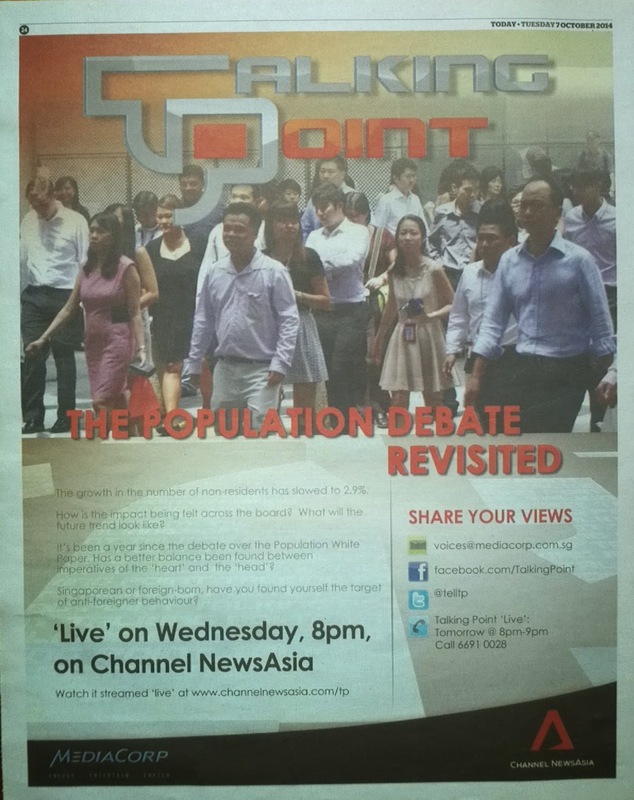 The person who spoke in the trailer (probably Talking Point host Steven Chia) said that there was to be a Talking Point episode that would revisit last year's population debate. Typically, such trailer would be broadcast one or two days before the Talking Point show — in this case, Wednesday 8 October. 8 October came. The Talking Point show dealt with the haze. Maybe Channel News Asia had a change of plans because the 3-hour PSI hit 153 on 6 October and the 24-hour PSI in the western part of Singapore hit 124 on 7 October — in each case, the highest this year. I waited for 15 October. That day's Talking Point show dealt with Singapore as an innovation nation. On 22 October, the Talking Point show dealt with autism. On 29 October, the Talking Point show dealt with Singapore's preparedness for Ebola. On 5 November, the Talking Point show dealt with coping with labour (i.e., work force) pains due to immigration having slowed somewhat. However, that is but only one of the many aspects of the Population White Paper 2013. Tomorrow's episode of Talking Point, which will be the last this season, will deal with rogue traders. What happened to revisiting last year's population debate? Perhaps, revisiting the population debate will once again bring to the surface simmering unhappiness about excessive immigration, over-crowding and competiton for PMET jobs, and the unforgettable 6.9 million population "planning parameter" for infrastructure development. That may not be such a good idea. That might have been the reason the programme was not broadcast. The question remains as to who gave the instruction to pull the plug.